Where can I get a floor plan? We have a 2d floor plan and 3d model available here. We hired Blue Ridge Tiny Homes out of Asheville, NC to bring our design to life. We were attracted to their passion for craftsmanship and love the final product! What do you do with the dishes on your open shelves when you move your home? The short answer is “nothing” because we don’t actually move our home on a regular basis! See my post about moving a tiny home. We got it at World Market. If they are out of stock, try a Google search for “chevron cowhide rug” to find similar options. We ordered it from Crate and Barrel and chose a reasonably priced custom color. We wanted a compact couch that would expand to a platform style bed (as opposed to removing cushions and folding out a frame/mattress) so we could easily pop it out for watching family movies together. We like it except it is a bit too firm. Despite some initial quotes from multiple builders in the mid $80-90k range, our final build came out to $111k (granted there were some changes and clarifications along the way). Our builder stated they would charge more if they built the same home again. I recommend you talk to a variety of builders before making a decision on who to use. 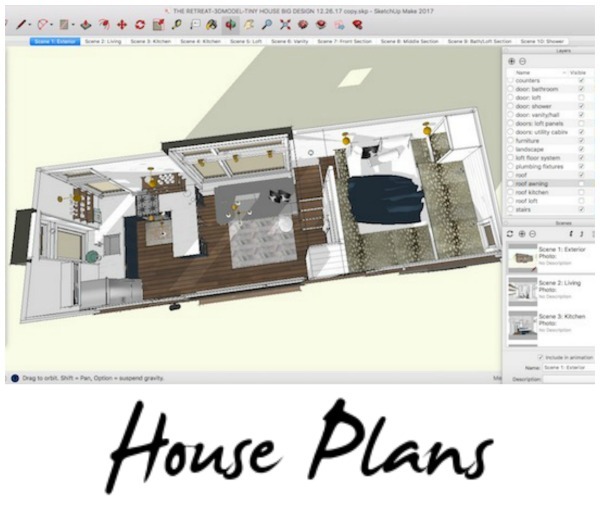 If you are building the same (or almost the same) home, you’ll get much more accurate pricing info by providing our house plan to the builders at the quote stage (fewer unknowns leads to a more accurate price). If the prices you get are too high, you could save money by making different material, fixture, feature, and appliance selections. Please leave a comment below with any questions, and I’ll update this page as appropriate. Hi Kaira – You are perceptive 🙂 Our trailer is 10×30 ft, which is wider than the standard 8.5 ft. This allowed us to create a very usable floorplan with few compromises, and is no problem since we won’t be moving the house regularly. Oh interesting! What are the implications of having a wider trailer when you move it? Do you need to pay official house movers or something? Hey Chris – Most people don’t actually move their tiny houses that often, but if you are wider than 8’6″ you can hire a professional transport company when needed or move it yourself, assuming you have a heavy-duty truck capable of hauling the weight of your home. You have to develop your travel plan (to ensure the roads on your route can accommodate the extra width) and obtain a permit from the Dept. of Transportation of each state that you will be traveling through. These usually cost around $65 each. So it’s certainly doable, just more of a hassle. 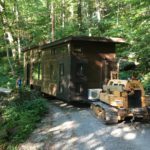 The decision was easy in our case because the last mile of our move was down a very narrow one-lane gravel mountain road with obstacles and tight switchbacks, plus I don’t have a truck 🙂 We hired Gaskins Moving out of Tennessee, and his team did an outstanding job http://www.illmoveit.com. Can you share where your sofa was purchased or custom-made? Hi Alix – I’ve just updated the FAQ with this info because a lot of people have been asking! We ordered the couch from Crate and Barrel and chose a reasonably priced custom color. We wanted a compact couch that would expand to a platform style bed (as opposed to removing cushions and folding out a frame/mattress) so we could easily pop it out for watching family movies together. We like it except it is a bit too firm. What a piece of functional art! Great Job to all involved! Thank you for all the effort that takes to share your passions and your journey with us. 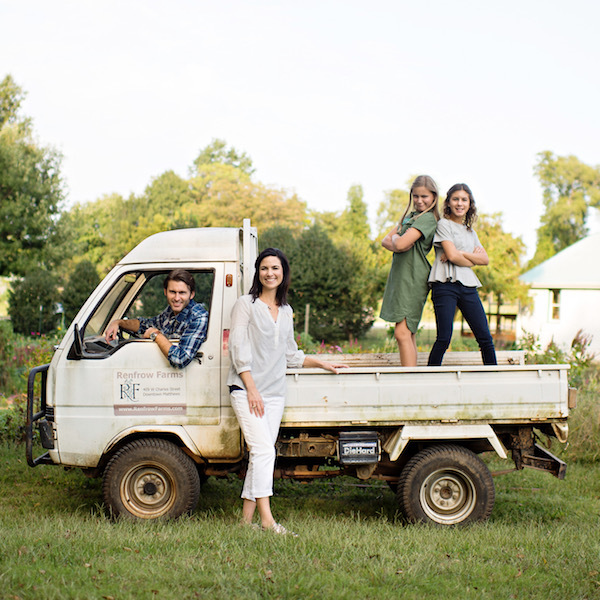 The blog, the plans, the cookbook—Lovely family, Grateful. Hey, can you share where you got your wall sconces above the open shelving from? Thanks! Aren’t those lights gorgeous? We got them from Schoolhouse. Hi, I think your floor plan is one of the best I have ever seen! I love the room with the bunk beds and the counter space/sinks, but where are the shower and the actual bathroom? Ae they on the opposite side of the 2 sinks? I did not see any pictures of how that all is laid out. We are in the process of remodeling a tiny cabin of our own. Just wondering what color paint did you use on the kitchen cabinets. I just love it! Thanks and enjoy your retreat! Hi Denise, It’s called Hague Blue by Farrow and Ball. Good luck with your cabin remodel! I love your tiny house! Such a great design and beautifully decorated. We have a small house and I’ve been looking to purchase smaller appliances. Can you tell me the name brands of the appliances and where you purchased them? Absolutely love this tiny house! If you don’t mind me asking what brand refrigerator is that? Thanks Amanda! The fridge is by Fisher & Paykel. Hello, I’m wondering where you purchased your oven or who the maker is. I love the size of it!